The weather outside today is amazing! Right?! So I decided to finally take pictures in this skirt that I made a few weeks ago that you may have seen on Instagram (@CheapbutChic). Spring is the time to bring out those maxi skirts and dresses. This year I decided that I wanted to make a few for my Spring/ Summer wardrobe. Let's talk about how amazing this fabric is! I purchased it from Hancock fabrics. If I can recall correctly, I think its a polyester and rayon mix. This fabric is usually used for maxi skirts and dress. It drapes on your body beautifully, it's lightweight, and it feels great. 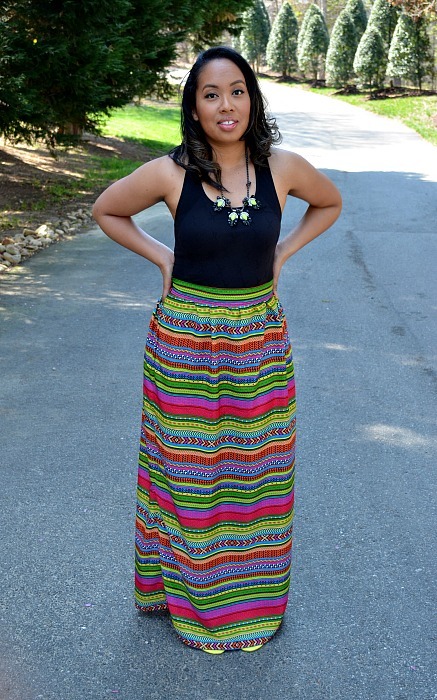 I definitely recommend that you pick up some fabric and make a few maxi skirts for this year. They are easily worn to make you look and feel like you are well put together. So here is my pulled together look. I ran errands today, so I paired it with a basic black tank top, neon statement necklace and flip-flops from Charlotte Russe. Be sure to follow me on Instagram (@CheapbutChic) and on Facebook (Cheap but Chic) for pictures of future posts and behind the scenes photos.